Festival season has started, banks has started giving discounts and various offers on loans. Buyers are always waiting for this discount season to get best bargains. This discount includes reduction in interest rate, waiver of processing fees and so on. This year also several banks including SBI, ICICI Bank, HDFC,UCO bank, have lined up discount offers to attract potential buyers. Many buyers get attracted towards this offer and opt for loan because of this discount. Starting offer discount SBI has slash processing fees on home loan and car loan by 50%, while ICICI bank has reduced interest rate on housing loan. ICICI bank is now offering floating rate home loans at 10.25% up to Rs 30 lakh and at 10.50% for amounts above Rs 30 lakh and up to Rs 3 crore until the end of the calendar year. This rate is around 0.25% to 1% lower than the normal rate on housing loans. HDFC has also followed ICICI and reduced home loan rate to 10.25% up to Rs 30 lakh and 10.5% for loans above Rs 30 lakh. While UCO bank has come up with combo offer on taking both car loan and home loan. They have waived off processing fees on home loan. Union Bank of India’s also offers processing fee waiver for home and vehicle loans. Similarly, Bank of Baroda has slashed interest rates on home loans by up to 1.50% and auto loans by up to 1.75% in addition to waiving off processing charges. Corporation Bank is offering a concession of 0.25% on interest rate for vehicle loans, if the borrower avails of both home and car loans. Processing fees are also waived off. 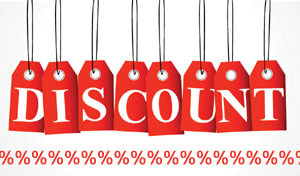 This discount offers are available only for limited period for the most of the banks. SBI’s reduction in processing charges will be valid till December 31. During the period, SBI will charge a minimum of Rs 1,000 and a maximum of Rs 5,000 as home loan processing fee. This discount offer tempt customer to buy home loan or car loan. Remember that taking loan is binding yourself in liability. With this loan you have to pay EMI for several years. Moreover if you default on making EMI payment it will have its own consequences including affect on your credit report. If you can afford and you are in genuine need of home for living than you must take home loan as home is appreciable asset and home loan provides you added advantage in terms of tax benefit. However, ensure that you borrow within your means. For instance, do not opt for a 3-BHK when a 2-BHK is all you need, simply because of your higher loan eligibility. A larger loan translates into a higher EMI, and you may find it difficult to bear this burden for 10-15 years. Cars or two-wheelers, are depreciating assets and auto loans do not fetch any tax relief either. Hence, stick to the one that fits into your budget rather than the one you have always dreamt of. It is not advisable to opt for a loan just because of discounts in the rate of interest or concession in processing charges. Technically processing fees discount or interest rate concession would cost you few thousand rupees, whereas the loan that is to be repaid runs into lakhs of rupees. So don’t get illogical by purchasing these loans because of discounts.